Struna Galleries and artist Timothy Jon Struna present a series of limited edition reproductions from his original paintings in the form of a giclee print. The term giclee (jhee-clay) translates from French as "to spray" and best describes how the prints are made. 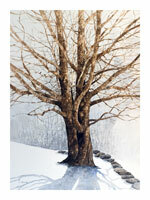 Original artwork is scanned into a computer or a digital picture is taken and transferred into a computer file. The image is then printed individually on a large format ink jet printer, using archival inks and heavy watercolor paper. Master and Studio Editions are limited to an edition of 200. The artwork is presented and framed using all archival materials.